At the Scottish Open, the warm-up to next week's British Open at Carnoustie, Phil Mickelson proved why he is one of the top golfers in the world. On the third hole, his ball hit the green and bounced into a pond. Mickelson put on waterproof pants, walked into the pond, hit the ball out and birdied the hole. The wind remained strong the entire day. 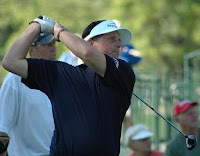 Mickelson finished the third round with a 3-under 68 and has a one stroke lead over Frenchman Gregory Havret (70). Englishman Steve Webster is three strokes back of Mickelson and is in third place. 0 Response to "What Good Looks Like"